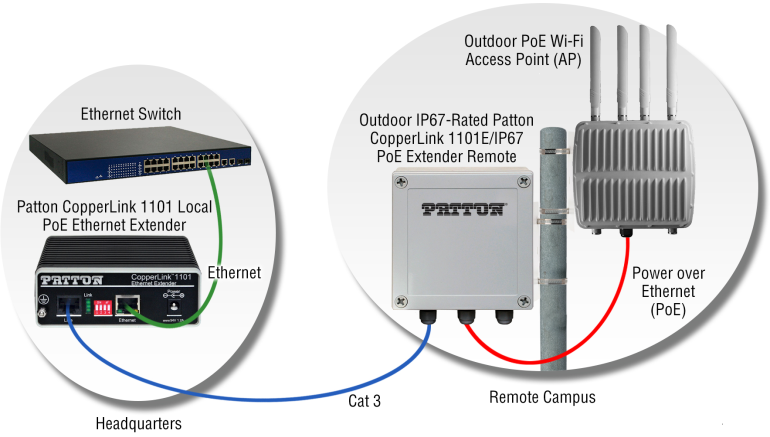 Where Do Patton’s PoE Ethernet Extenders Fit? 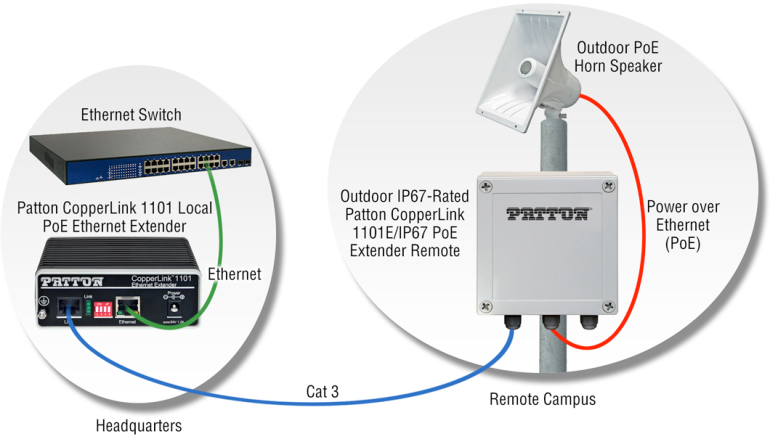 Patton’s CopperLink 1101 PoE ethernet extender extends your Ethernet or network segment beyond its standard distance limitation ( 3300 feet/ 1005 meters) so that you can have more flexibility to install your PoE-compliant devices like the Wireless Access Points (WAPs), IP cameras, and more at a convenient location. Many factories with vast open spaces face wireless dead zone issues. 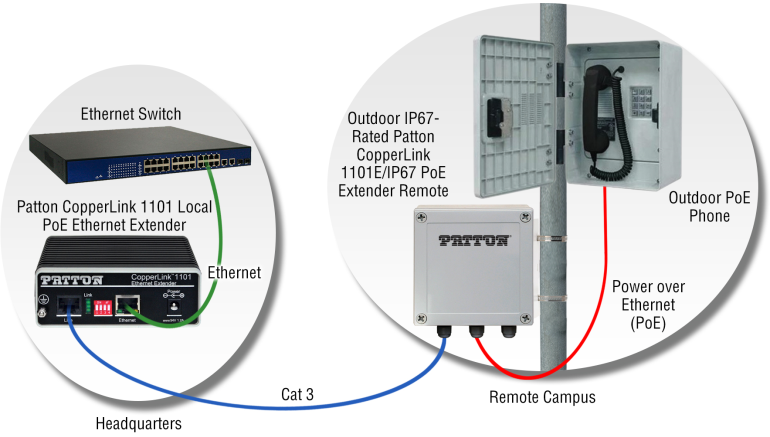 With the CL1101, we are able to extend the wireless connectivity using an existing wired Cat-3 cable connection between the Factory headquarter and remote campus. So that you can place your WiFi access points at strategic locations, eliminating wireless dead zones. This improves outdoor wireless coverage density, Wi-Fi connections and it helps industrial tablets and smartphones communicate effectively over WiFi for measurement and control applications. When using your SIP phone outdoor with the SIP server located away at the campus factory headquarter, your SIP phone can still be powered up via a PoE connectivity. The CL1101 Ethernet Extender allows your SIP phone to communicate smoothly with no power outlet required at the remote site. The distance is no longer an issue! 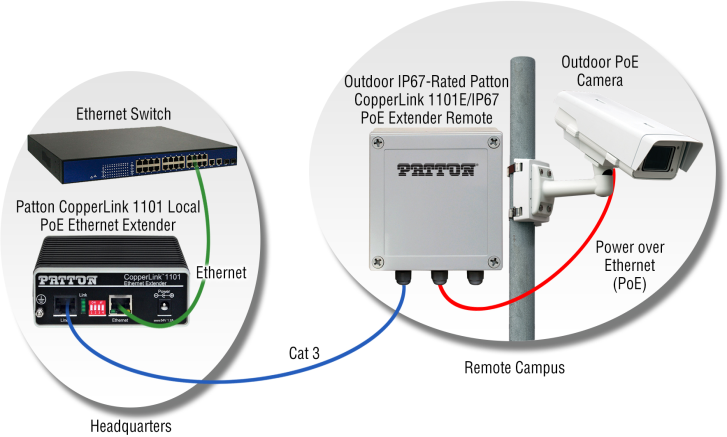 A typical Outdoor IP surveillance camera requires two connections, AC power and a high-speed network connection for video recording and display; however, with the PoE Ethernet Extender, you will just need one cable! The CL1101 provide both power and a 100 Mbps Ethernet connection from one single cable to enable a simple surveillance solution. Install your horn/ loudspeaker anywhere you want with the CL1101! You will be able to deliver power PoE power and Ethernet connectivity to your outdoor SIP-based speakers. The PoE Ethernet extender allows the horn speaker to communicate with the SIP-based Paging system at the headquarter on the 802.1Q VLAN tagged voice VLAN. With the CL1101, you are finally able to perform the most effective voice paging and mass notification/ alerting at the convenient location you need! Are you using the CL1101 Ethernet Extender? Where do you use it? How does it help you achieve your goal? Share with us!